Today starts a new series of posts on walking through one of the key classes of reaction in organic chemistry: substitution reactions. The role of stereochemistry in substitution reactions. How to predict if a substitution reaction will proceed through an SN1 or SN2 pathway, given a starting material and a set of conditions. Assuming no background knowledge except a understanding acid base reactions and a knowledge of how to see hidden hydrogens, look closely: what bonds are formed and broken in each case? In each case we’re breaking a bond at carbon and forming a new bond at carbon. In other words the carbon has swapped partners. Let’s take the first reaction and ask the second key question when understanding a new reaction: where are the electrons in our starting materials? We have an electron rich species (the oxygen) forming a bond with an electron poor species (the carbon attached to the Cl). Using relative electronegativities to understand reactivity, and knowing that opposite charges attract, and that electrons flow from negative to positive, it’s easy to imagine an interaction between these two atoms. Third question: how do these electrons move, then? Well, the oxygen went from negatively charged to neutral – from owning a pair of electrons to sharing a pair of electrons with carbon. And the chlorine went from neutral to negatively charged – from sharing a pair of electrons with carbon to owning a pair of electrons. It’s too early to say conclusively how this reaction occurs at this point without further experimental results, but any description of how the bonds form and break (the mechanism) will have to explain the timing for the forming of the O-C bond and the breakage of the C-Cl bond. By the way, does this type of reaction remind you of anything you’ve seen before? It should, if only a little bit. It’s kinda like an acid-base reaction, where we’re breaking and forming a new bond at hydrogen, except we’re breaking and forming a bond on carbon instead. 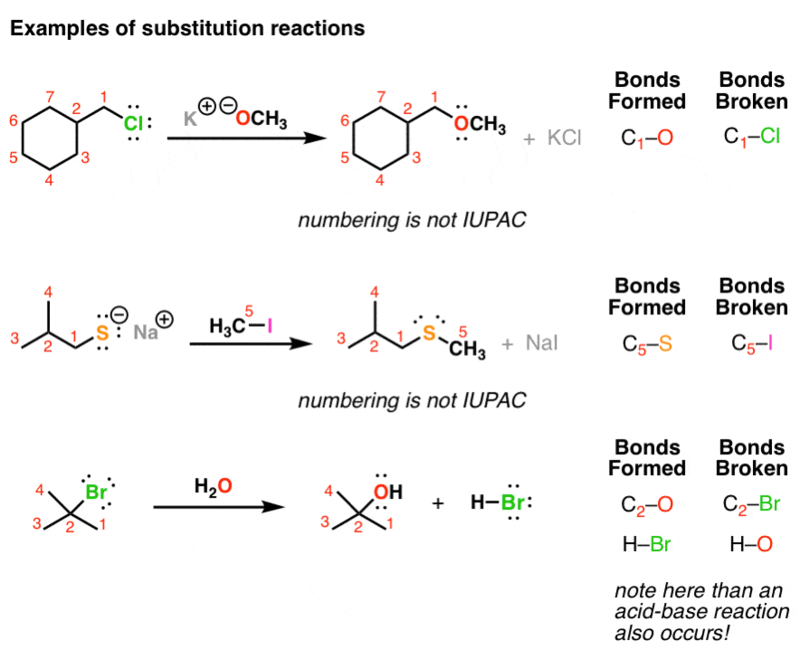 A different terminology has been developed to describe each of these components for a substitution reaction, as opposed to acid base reactions. 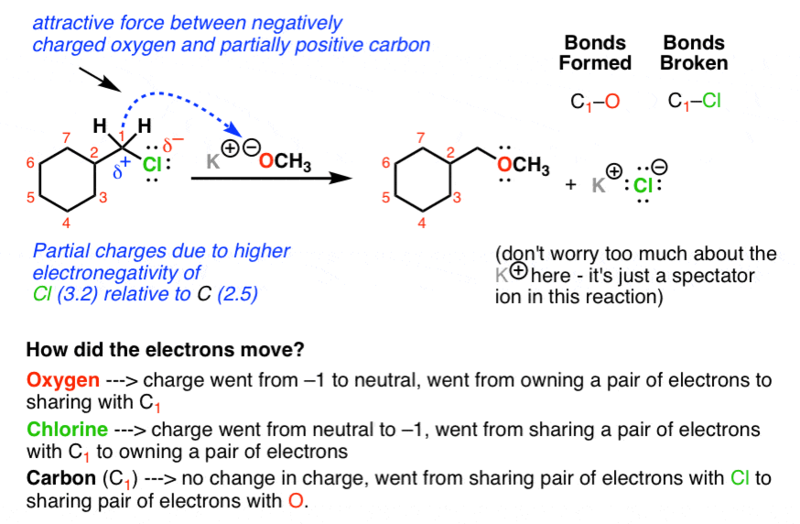 In the substitution reaction, we have an electron-rich species (the oxygen) donating a pair of electrons to an electron poor species (the carbon) which forms a new product (the alcohol) and a new base (the part kicked off when the C-Cl bond broke). 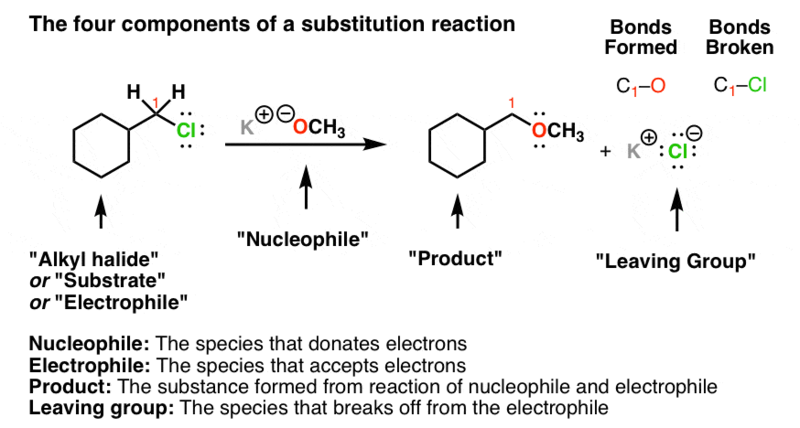 The nucleophile is the electron-rich species donating a pair of electrons to carbon. The electrophile (or “substrate” or “alkyl halide” in this case) is the species accepting the pair of electrons. The species formed is the product. The new base that breaks off of the carbon is called the leaving group. Next time, let’s understand this new concept – “nucleophilicity” in more detail, and how it differs from basicity. Chemistry is an experimental science. Unlike theorems in say, mathematics, which can be derived from a starting set of premises, the body of knowledge in the science of chemistry is one that has been obtained through experiments and observations. We only figure out the premises by looking backwards from the results of our experiments! The bottom line here is that the reactions described here are observed to happen, and these observations have been reproduced thousands of times by scientists working in different decades, from different countries, speaking many native languages. This stuff just works. Some of them you might perform in a teaching laboratory; others, you’ll just have to take our word for it (but are always free to try to falsify these observations, of course). Maybe one day you’ll get the chance to do some of them yourself. In the paragraph under “Third question: how do these electrons move, then?”, I believe “And the bromine went from neutral to negatively charged” should read “chlorine” instead. Thank you for your time and dedication, it has been of great help! In the paragraph under “Third question: how do these electrons move, then?”, I believe “It’s too early to say conclusively how this reaction occurs at this point without further experimental results, but any description of how the bonds form and break (the mechanism) will have to explain the timing for the forming of the O-C bond and the breakage of the C-Br bond” should read “C-CI bond” instead. Also,I believe “In the substitution reaction, we have an electron-rich species (the oxygen) donating a pair of electrons to an electron poor species (the carbon) which forms a new product (the alcohol) and a new base (the part kicked off when the C-Br bond broke)” should read “C-CI bond” instead.